Celebrating Winter Veil in Style! My shaman in her gnome disguise, riding a Tyrael’s Charger disguised as a reindeer, and with the Winter Helper out tripping on Papa Hummel’s Pet Biscuits. Re: Celebrating Winter Veil in Style! Dawww. I may need to steal this screenshot idea. 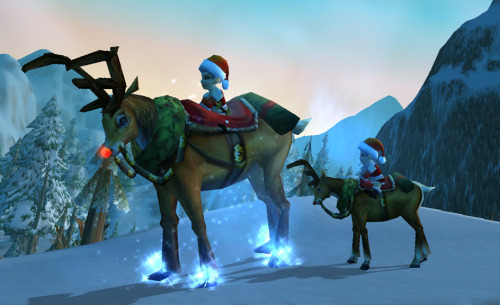 Does the Winter Help fly with you when they're mounted on their reindeer? Sad face! Lazy little guys. They need some pixie dust sparkle in their hooves. Think happy thoughts, tiny reindeer!